This year, the mountain welcomes seven more state groups than last year, propelling the total state count to 40. According to CONA program director Sam Adams, four states currently lacking YIG programs on their home turf will join together in a coalition called the Ambassador Delegation. The group will comprise students from Alaska, Utah, Nevada and Rhode Island. He added that the remaining 36 groups are divided into full and multi-state categories contingent upon how many delegates enroll. Multi-state groups contain fewer than five delegates and encompass Arizona, Colorado, Montana and Oregon. 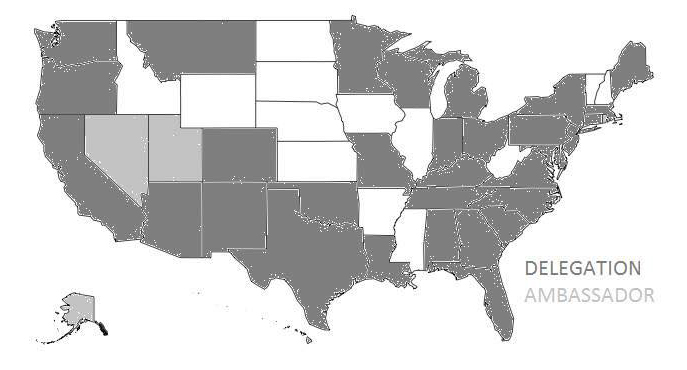 Alaska, Nevada, and Utah are the newly christened delegations, while Colorado, Hawaii, Georgia and Rhode Island return after an absence. Distance and affordability helps to determine the medium that each respective delegation used to reach conference. Adams added that the criteria for creating new delegations is simple. Ambassador Delegation exempt, the states seeking to attend must host a YMCA-sponsored Youth in Government program. “There is no approval process on our end,” he said. The official website states that CONA delegates are handpicked from a pool of approximately 50,000 students that participate in YIG programs. New states will be mentioned at opening ceremonies at the outdoor amphitheater, and will join in the procession of flags alongside longstanding delegations.